The presser on Sunday was crowded and a little hectic so it didn’t naturally lend itself to too much of a theme so to speak. I did have the opportunity to ask all of the artists at the press conference about their passions outside of music. The passions of various members of The Steep Canyon Rangers was wide ranging. And Graham’s passion was his hot tub. Alison Brown’s passions are the banjo and the roots music community. Sam Bush’s passion is baseball (Go Cards). Steve Martin’s passion is the banjo. It was really interesting for me to see what musicians are passionate and I was glad that I Had to Ask about musician’s passions. A big part of MerleFest is the history it has and the legacy it continues to carry. This was a hot topic at yesterday’s press conference. 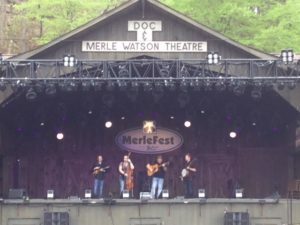 According to Jerry Douglas MerleFest is different because not only is it the first music festival of the season, it has the most performers so it is like a big family gathering. John Cowan feels MerleFest is different because it feels good due to the fact that MerleFest embraces different types of music (as Doc wanted). Jim Lauderdale feels that MerleFest is different because it sticks with the traditions of having musicians like Sam Bush and Jerry Douglas back, but, they also capture the younger generation of performers and invite them in. MerleFest also proves to be important to the health of bluegrass and traditional plus music. John Cowan explained that MerleFest allows for great memories of living legends. Tommy Emmanuel explained that MerleFest is important because it continues a legacy AND hooks the younger generation. No matter who you talk with you will find that it is incontrovertible that MerleFest as a festival is important to the health of music. Thanks for reading about what I Had to Ask. MerleFest 2018 is going great! I have had made many memories, experienced some cool moments, and heard plenty of awesome music! 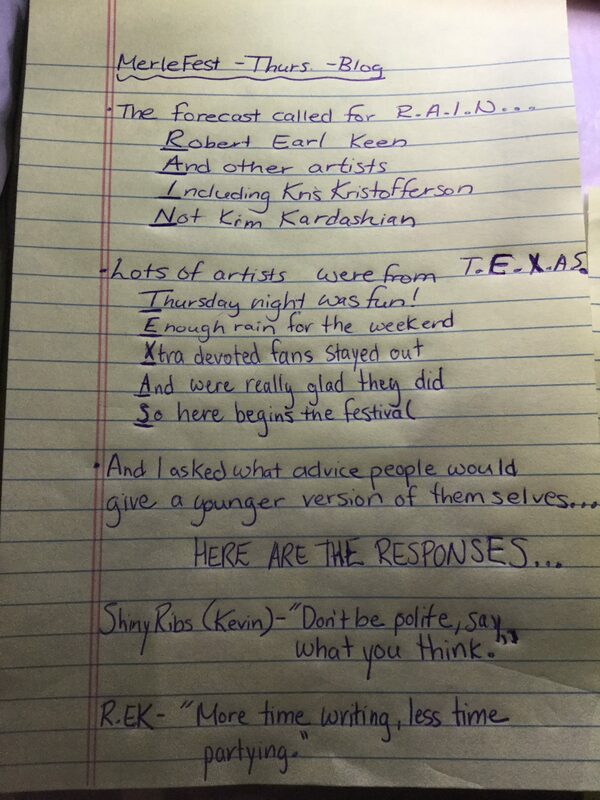 When with musicians, you’d up talking a lot about music. It turns into a common theme. What are you listening to in your car? 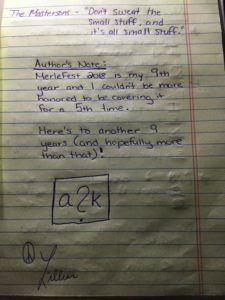 Thanks for reading what I Had to Ask! The Canadian band, Rosie and the Riveters, were a huge hit especially with the young women at MerleFest 2018! Their demeanor and style are both unapologetic and fierce. They stand as a symbol of independent feminism with their strong stand-up vocals. Rosie and the Riveters look and sound like the female role models young women in North American need today! I found it amazing that thy could gracefully, yet powerfully, promote ideals like equal pay for all in song without being too “in your face” about it. Rosie the Riveters needs to be the next band added to every girl’s playlist! As the threatening rain cloud rolled away from the Watson stage, fans sitting on the field were in for a treat! Nu-Blu had a wonderful set on the Watson Stage at 1:30 on Friday. Carolyn’s powerful and animated voice paired with the driving rhythms filled the air. Listeners weren’t hungry for lunch, they were hungry for more Nu-Blu music! I remember how genuine Carolyn was. She still continues to be a genuine beacon of strength and hope to many. They played some songs off of the album today, and they were wonderful. Where did you get all of your energy that you have on the stage from? 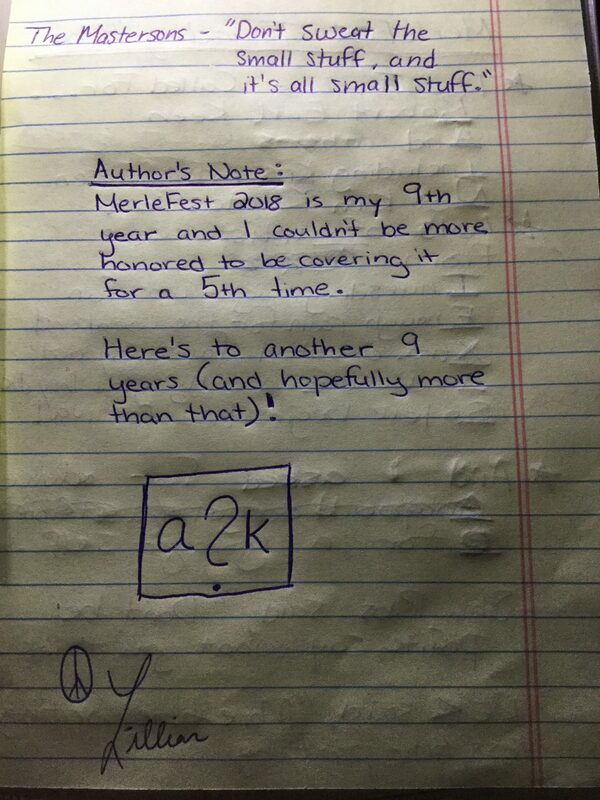 I have been planning to blog during my time at MerleFest, but I am also camping so my access to internet etc. has been limited. 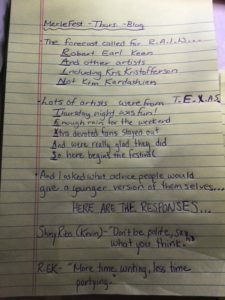 I didn’t want to not blog, so I got creative and wrote it out while seeking shelter from the rain in my tent.